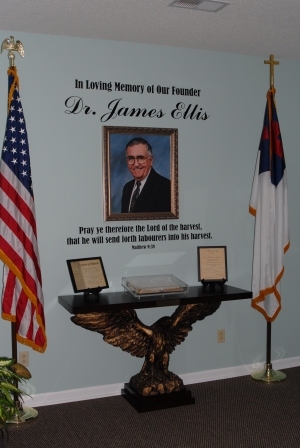 Dr. Ellis was in the Christian Ministry for over 60 years. He was saved in 1950 and called by God to preach in 1951. The first part of his ministry was involved in home prayer meetings, helping to start local churches and radio work. Following that, he pastored an Independent Baptist Church for 13 years, which included 11 years of being associated with missions. The Lord had continually burdened his heart about areas through out the world that do not have a good gospel witness. God led him to establish and incorporate a home mission board, Fundamental Baptist Home Missions, Inc., which has at its heart the starting of indigenous local Baptist Churches. Fundamental Baptist Home Missions, Inc. was begun in June 1982 as a result of a burden for Fundamental Baptist Churches to be established in areas without a gospel witness and to strengthen the local church through missionary evangelism. Today the Mission Board has over 140 Missionary families that it serves through out the USA, Caribbean Islands, Central America, South America, India, Mexico, Africa and the Philippines. Dr. Ellis was a dedicated laborer for Jesus Christ and his wife Lucille still works tirelessly at the mission board carrying on his life's work. The subject of home and world missions was the center of his heart. Their lives have been dedicated to this ministry for many years.